Hidden for years, the mysterious Court of Owls surface in Gotham City what must Batman to defeat them and what deadly connection to they have to his past? Scott Snyder and Greg Capullo’s masterpiece epic is collected in its entirey for the first time ever! After a series of brutal murders rocks Gotham City, Batman begins to realize that perhaps these crimes go far deeper than appearances suggest. As the Caped Crusader begins to unravel this deadly mystery, he discovers a conspiracy going back to his youth and beyond to the origins of the city he’s sworn to protect. Could the Court of Owls, once thought to be nothing more than an urban legend, be behind the crime and corruption? Or is Bruce Wayne losing his grip on sanity and falling prey to the pressures of his war on crime? 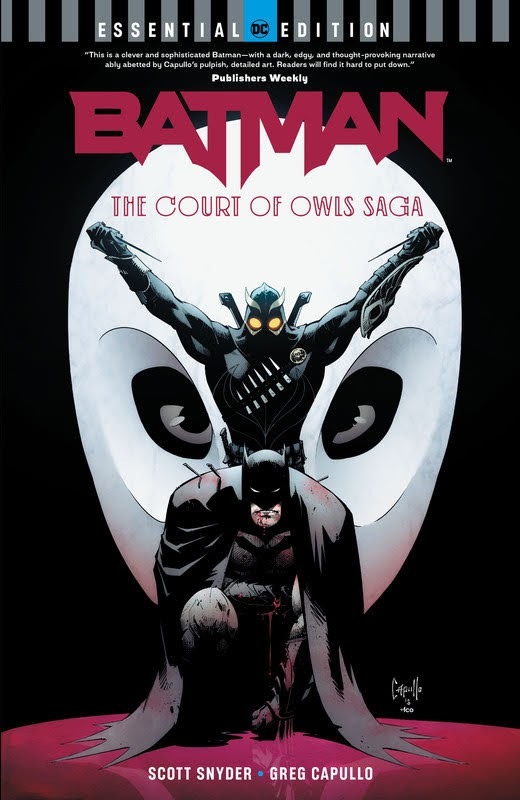 Considered one of the greatest stories in the Dark Knight’s historic lore, BATMAN: THE COURT OF OWLS SAGA is an epic tale told by two of comics‘ finest storytellers.